First Brexit, Then Trump, Now the Italian Referendum. Is a New Shock in Store? This has been a year of political shocks. First came the Brexit vote by the U.K. to leave the EU, on June 23. Then came the election of Donald Trump as 45th president of the United States, on Nov. 8. In both cases, the polls and pundits got it wrong. Elites expected the U.K. would remain in the EU (it voted to “leave”) and that Hillary Clinton would be president. Now comes another key vote with major market implications. On Dec. 4, Italy will vote on a package of constitutional reforms. The particular reforms are less important than the populist backlash against the proposal. 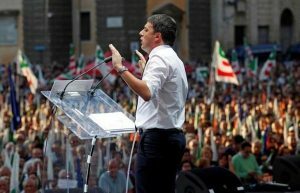 If Italians vote “no” in the referendum, Italian Prime Minister Matteo Renzi will resign and a new government will have to be formed after elections. This could lead to a period of political chaos, with implications for the EU and the euro. Right now polls show the “no” vote ahead. Of course, polls were wrong about Brexit and the U.S. election, so they may be wrong again. But there is good reason to believe that “no” will prevail. What is significant about Italian polls is not just that “no” is in the lead, but also that the vote is trending toward “no.” Such trends dominate any statistical margin of error in predicting outcomes. Click here to see why even though elites may see this Italian result coming more clearly than Brexit and Trump, that does not mean they are prepared for the consequences. Get ready for another political shock and the market volatility that comes with it.